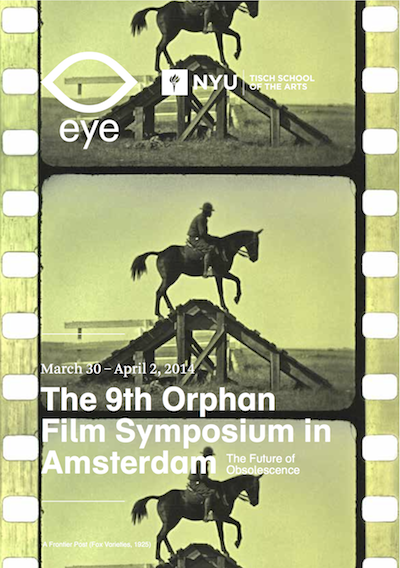 From the evening of March 30 straight through the evening of April 2, NYU Tisch / Cinema Studies co-hosted nearly nonstop screenings and presentations in the already landmark building known simply as EYE, the home of our host, EYE Film Institute Netherlands. The 9th Orphan Film Symposium featured more than 70 presenters, nearly as many movies, and more than 200 attendees, who came from 30+ nations. The numbers give some idea of how intense and, yes, exhausting the event was. Yet “Orphans 9” yielded innumerable moments of excitement, serendipity, and rediscovery. Thanks to our generous EYE hosts and spirited colleagues, the symposium also sparked interstitial connections and new partnerships we will continue to hear about in the months ahead. Even with the highly international cast and, for the first time, a European location, NYU Cinema Studies was well represented by a couple dozen faces. Faculty members Antonia Lant (below, right), Mona Jimenez, Dan Streible, and (via Skype) Howard Besser were on the presenting end of things, as was adjunct faculty and film preservation guru Bill Brand. NYU Cinema Studies alumni Juana Suárez, Walter Forsberg, Benny Olgado (aka Bono), Charles Musser, and Paula Félix-Didier also gave presentations, as did our PhD candidate Maria Vinogradova. MIAP students Pamela Vizner and Athena Holbrook each moderated a session. Other alumni attending: Natalia Fidelholtz (Storycorps) and Kathleen Maguire (Exploratorium). Current graduate student symposiasts: Catherine Park and MIAP’s Lorena Ramírez-López, Emily Nabasny, Genevieve Havemeyer, Jasmyn Castro, Julia Kim, and Blake McDowell (who produced this video trailer, screened throughout the symposium). Filmmaker and NYU Tisch Film-TV adjunct David Bagnall also produced a trailer, and designed our logo. And Lukas Brasiskis (Vilnius Academy of Arts) traveled to Amsterdam from Lithuania; he will be joining our PhD program this fall. And there’s a Tumblr to boot (thanks to MA student Cate Park): orphanista.tumblr.com.